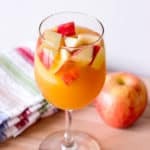 Caramel Apple Sangria Recipe – Apple cider sangria with caramel vodka & white wine. This is the best easy Fall sangria recipe. This fruity drink tastes like an adult caramel apple. White wine mixed with caramel vodka, apple cider, and chopped apples. Serve this at your next holiday party or any time of year. You could switch up this easy sangria recipe by using sparkling apple cider. It will have the same great fall flavors, with a little extra bubble and fizz. I use pinot grigio for this because I like dry wine. If you know you like sweet wine, you could use something like riesling or moscato. Just remember the apple cider will sweeten things up too. Serve it chilled or over ice. 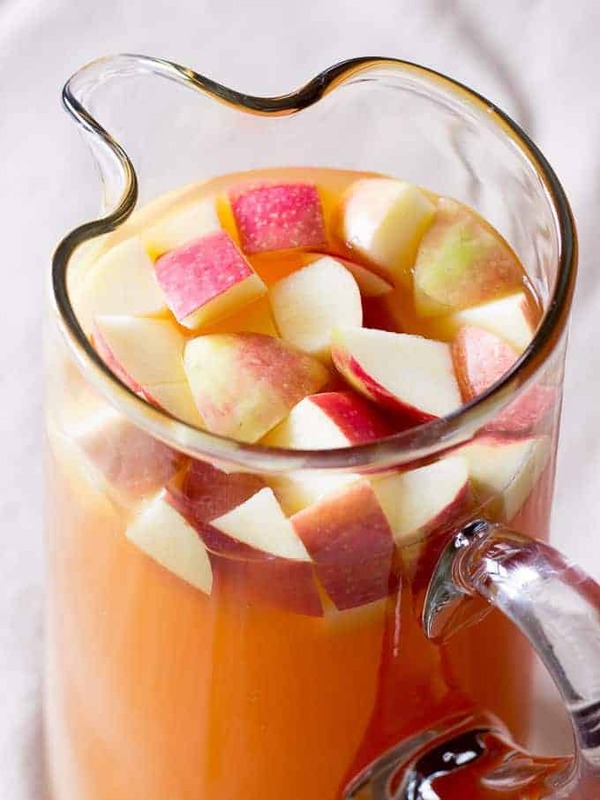 Add chopped apples to each individual glass or to the sangria pitcher. How do you make Caramel Apple Sangria? In a large pitcher, add 1 bottle of mild white wine. Add caramel vodka, and apple cider. Then, stir. 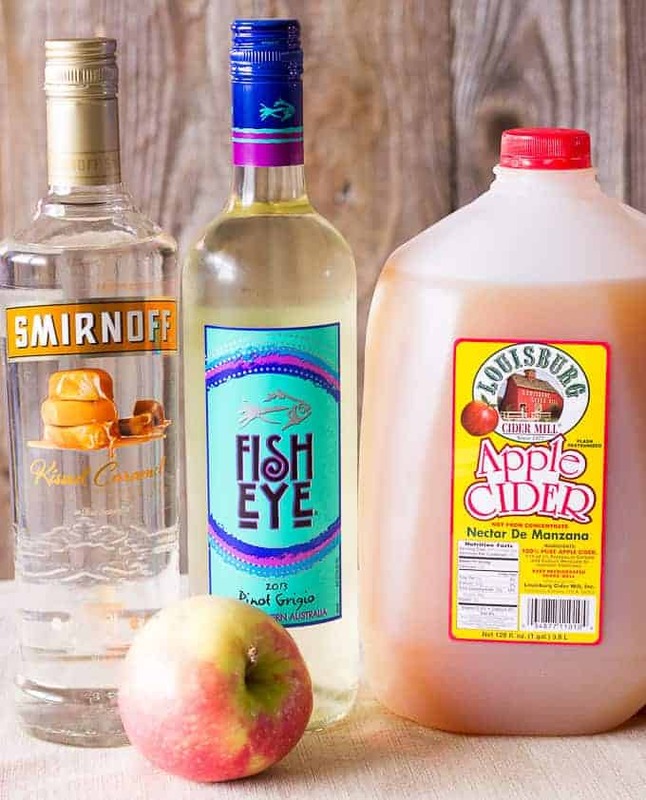 Caramel Apple Sangria Recipe - Apple cider sangria with caramel vodka & white wine. This is the best easy Fall sangria recipe. Serve the sangria cold or over ice. Can this be warmed up for the winter/cold months? Keep in mind that alcohol boils at a lower temperature than water. And, if it is boiled, some of the alcohol will ‘cook off’. You could heat up the apple cider then add the alcohol. I put the cider in a crock pot, along with cinnamon sticks, a whole orange with cloves stuck in it and 1/4 cup of brown sugar. Then I just put the bottle of caramel vodka beside the crock pot, and my guests can add it, or have it alcohol free. How long is the shelf life ? When should it be disposed? SHELF LIFE???? Drink up and enjoy!!! Basically, it depends. As long as it’s stored in a sealed container in the refrigerator, it will be good until the expiration date listed on the apple cider container. However, once a bottle of wine has been opened, the taste will deteriorate over time. Some wines will take on a vinegary taste and aroma after a couple of days. This depends on the type, brand, and year of the wine. Since the wine is being mixed up in a sangria, I always buy inexpensive wine for this. And, I haven’t had any problems with the taste after a few days. I’m pretty sure I’ve stored it up to 4 days without any problems. Beyond that, I’m not sure how good it will be. I made this at an atumn-themed party I had a few days ago and it was a HUGE hit! Absolutely delicious; I had to warn people that it actually was alcoholic because it just tasted so good. One moderation I made was adding about 1/2 a cup of fireball rum and it was awesome! Thanks Madison! I’m glad you liked it! Did you substitute the Fireball rum for the vodka or combine the two? How would this be with regular vodka? I have Celiac Disease and can’t have flavored vodka (I can only drink certain brands that are distilled from non-wheat grains). I’d love to have this for our Halloween party. Thank you! This cocktail gets all of it’s caramel flavor from the caramel flavored vodka. So, you could add caramel flavoring in other ways. I know they make caramel flavored coffee syrups, hopefully some of those are gluten free. You could also add caramel extract, which some stores carry in the spice section. How much caramel syrup would be needed if making with plain vodka? When I made this i simply warmed the apple cider and stirred in a few tablespoons of caramel (i let it cool before adding the boozy part) the brand was Bonne Maman, its a spreadable caramel thats pretty good, though I do get it here in germany I don’t know about stateside brands. It worked out just fine, for a party tomorrow I think i shall try mulling the cider first then adding in the alcohol once its cooled. Try infusing a bottle of vodka such as Chopin or Ciroc (both gluten free) with caramel candies. Buy about 20 of the bite sized candy and place into an airtight container with the vodka. Shake it vigorously and then let it sit for about 3 or 4 days tasting each day, shaking periodically. Strain it with a cheesecloth when the flavor is just right and you’re all set, Gluten free caramel vodka! You can also add a quarter of a teaspoon (at most) of salt to make it a salted caramel vodka. Have fun!! I’m making this tomorrow for a girls’ night, perfect for this cold weather. Any ideas on what to eat with a drink like this? We need something to munch on and to soak up some of the booze! Ella, Cheeses and cold meats, nuts and dried fruits goes very well with it! Enjoy it! This sounds wonderful! Going to serve this at thanksgiving. I was wondering what brand Pinot Grigio is best? Made this today, half with pinot and half with moscato. LOVED the moscato, really helps mask the vodka’s strength. Pinot tasted like cough syrup. I’ll make the moscato one again for sure. Thanks for the recipe! How would you make this if you wanted it virgin style? can a lil bit of club soda be added for some sparkle? I subbed the cider for sparkling apple cider! Was it ok???? I did the same! Did anyone find out if using salted Carmel vodka would be ok? My husband bought that instead of regular Carmel vodka. In case you all were wondering, I have calculated the ABV for this mixture. Using 30% spirits and 13.5% wine, this cocktail weighs in at a nice 7.2% ABV. Drink responsibly! How much vodka do you use? Any idea how this would taste using a white zinfandel and sparkling cider instead or pinot and regular cider? I think it all depends on your taste preferences. If you typically enjoy sweeter wines like white zinfandel, then you will probably like it in this drink. I think the sparkling cider idea is great! It would just give it a little bit of fizz, which sounds lovely. I made a large batch of this and many thought it was too sweet! I can’t drink /test it myself, but has anyone ever cut it with a 1/4 c of bourbon and/or added club soda to cut the sweetness down? Other options could be to add OJ, but I don’t know how well that would go… Thank you! Can you use spiced apple cider? I love that you have Louisburg cider. I have a lot of family there. It’s all I buy! We can get it here in Omaha! made this last night for friends before a christmas party and everyone LOVED IT!!! I chopped apples and cooked them down with some of the sangria plus cinnamon and maple syrup, put it in a bowl on the side for everyone to add and that made it really awesome. Will definitely make again, it was a total hit. THANK YOU! About how much would you need to make 3 gallons. Doing for my wedding? If you make 3x this recipe it will equal three gallons roughly. Oops! Typo! If you make 4.5x this recipe you will have 3 gallons roughly. Great cocktail idea for Halloween or even Thanksgiving!! Whoa! I love caramel apples and never would have thought to make a cocktail! I would love to make this for my wedding but vodka makes some people I know, less than friendly. Is there a substitute I can use instead of vodka? Last thing I need is a fight at my wedding! LOL! I just made this for a Halloween party, and at the suggestion of my bartender friend, used an alcoholic dry apple cider, and had to substitute salted caramel rye instead of the caramel vodka (the only one my local LS had was quite a bit more expensive!). My first attempt was VERY strong lol, but when I made the full batch I added half a carton of pure apple juice and it was amazing! A few cinnamon sticks and diced apples made it perfectly seasonal and absolutely delicious. Thanks! 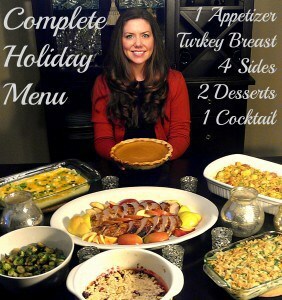 Served this last night and it was a big hit! I was wondering if this could be made and stored in canning jars nd placed in the fridge. I was going to make it now and have it for Christmas or New Years but wasn’t sure of the “shelf life”, or if the apples sitting in it would make it go bad. I made this for a family gathering on Christmas. I followed the recipe exactly, except I added some whole cranberries to make it more festive. The flavor was delicious, not too strong, just right! Everyone loved it.